I picked up another four buildings from Tiger Terrain at the end of last week. 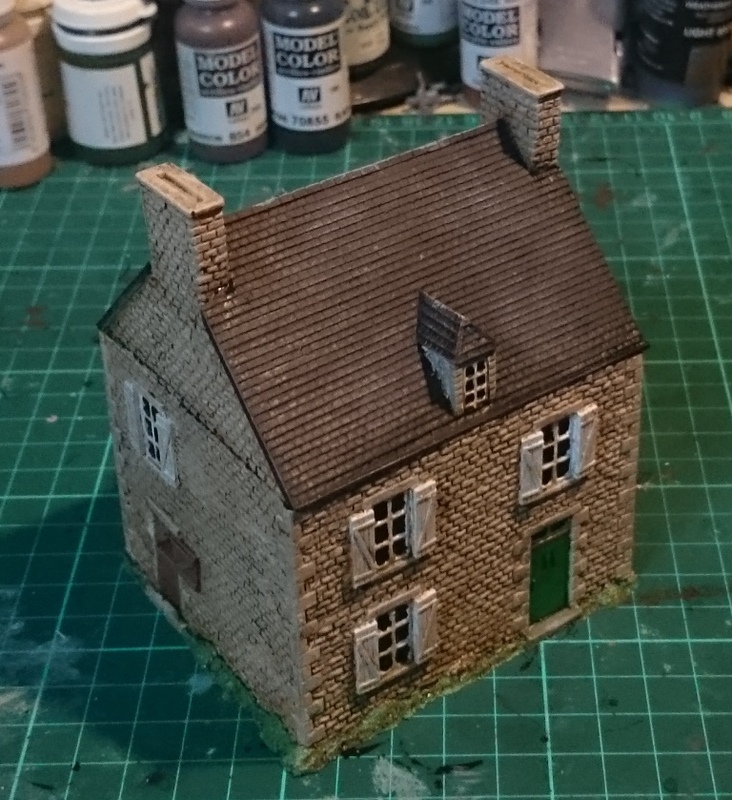 The next scenario in our campaign has a chateau complex which includes a couple of large barns – I only had one, so need to purchase/paint another. I decided to get some of the remaining buildings on our shopping list whilst I was at it. Tiger Terrain does a great selection of buildings, but not all of them have removable roofs. All the buildings we have (with the exception of the church) have removable roofs – we wanted to keep everything the same if at all possible. I’m not altogether happy with this one – I used too dark a wash (brown ink) and so the final brickwork I was drybrushing over was too brown. The final result is OK, but perhaps looks a bit too patchy. I will wait to see what it looks like of the table before deciding what I need to do further with this. This is a nice little building. I think the brickwork around the bottom needs some more work, otherwise this isn’t too bad. My favourite building of the four. Well, I managed to get these painted in a couple of days – as I said, not 100% happy with them, but they should be pretty serviceable. I will see what they look like on the table, next to our existing buildings, and then decide what further work I need to do. Agreed. The wash I used didn’t really sink in – it’s the same one that I used on the bottom two buildings, but the much finer brickwork didn’t really get picked out. Maybe I should use the same ink as I did on the barn, as the brickwork is the same size.